Today we are discussing mass attacks. ‘Mass attacks’ is fairly vague term because it can encompass so many different types of attacks and attackers. A vague definition for this vague term is: Assailant(s) who target less protected indoor or outdoor spaces. Who also use weapons to attack crowds and use the attack(s) to intimidate and cause chaos and can use any type of ‘weapon of opportunity’. A weapon of opportunity is anything readily accessible for the attacker. It could be a box truck, like the attack in Paris or a knife attack, a bomb, gun, suicide vest, lead pile, candlestick, etc. The types of attackers you may see in a situation like this is an active shooter(s). These are not necessarily the most typical, but the most widely spread by the media. There is also an Intentional Vehicular Assault (IVA) which is someone using a vehicle to cause mass casualties. An Improvised Explosive Device (IED) which is an individual (or group of people) that are using homemade bombs, often in manual pressure cookers, to cause mass casualties. There are many other methods of attacks such as sarin gas exposure like the Tokyo incident in 1995. It doesn’t take much to hurt a lot of people, who are not aware of what is going on around them. So, how does one protect themselves from a mass attack? How do we see it coming and what do we do if we find ourselves in the middle of it? Well, the first aspect of protection is to stay alert. Be aware of what’s going on around you. Check out these vlogs on the color codes and OODA Loop to get a better understanding of how critical the right mindset truly is. Having the right mindset to gauge your situation and how critical it is getting is going to be the biggest asset you have. When you’re in tune with your surroundings you should be able to pick up on abnormal things. You can observe without standing around with your hands in your pockets watching people like a creeper. You can pick up on phone conversations, people acting strange, bags that don’t have a human near by, etc. You’ll start to notice things that are weird. If you happen to see something strange TELL SOMEONE! This is what Law Enforcement is for. It is their job to take information and determine if it is a threat. That’s what they’re trained to do. Don’t feel weird to silly for calling 911 over someone acting strangely. You could be stopping the next active shooter. Some abnormal things to be in tune to are unusual or threatening conversations, behavior that promotes violence, unattended packages, pre-attack indicators, aggressive grievances related to an interpersonal situation like a job issue, domestic issue, relationship issue, friend issue etc. Part of that proper mindset of being in tune with your environment is always knowing where the nearest exists are and where you would do for cover and concealment. While you don’t need to spend minute every time you move locations in a mall figuring this out, a half a second acknowledgement or wargaming session on exits, cover, and concealment may be the difference between life and death for you and your loved ones. When you’re in a new location attempt to identify at least two exits near you at all times. As airline flight attendants always say, be aware that the closest exit may be behind you! duty to make it home alive and protect our families in the process. 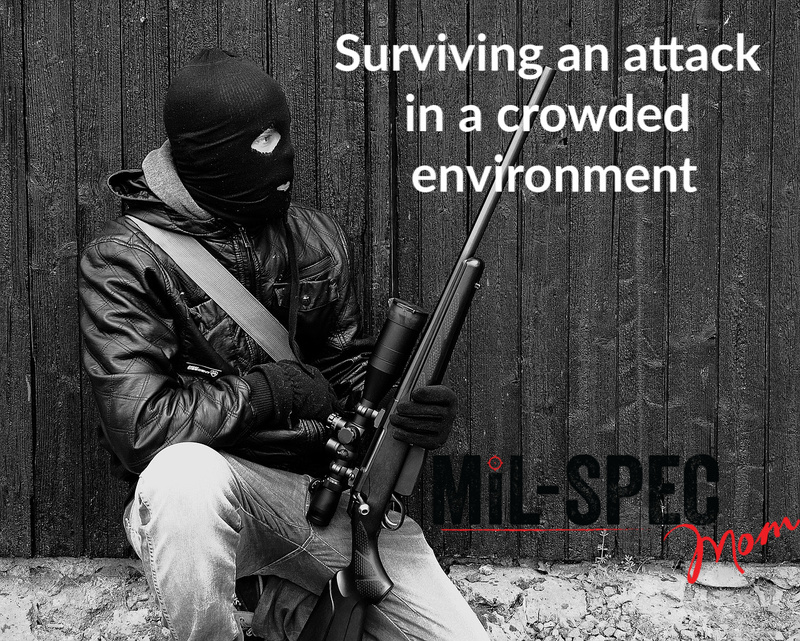 You have to stay alert; it can be exhausting at times, but it is critical to surviving an attack in a crowded location. Attempting to leave should be your first course of action. If you can’t leave the scene or situation then attempt to find cover and hide and stay silent. If you’re familiar with the RUN, HIDE, FIGHT model from the FBI, this is essentially what it is. However, as newer training is coming out it is not run THEN hide THEN fight. It is more like this: run OR hide OR fight, depending on your situation. This is what makes training so important. You will have to make that decision within seconds, and you may not have all the information. Nor do you need to wait around to get it. The more training you have, the quicker you can make that decision and start to implement life saving tactics. If you can’t ‘run’ or leave the situation and there is no where for you to hide that is ballistically sound (bullet proof or resistant) then you may have to fight. This would mean proper implementation of a firearm, while taking into account any collateral damage or criminal negligence. Criminal negligence sounds like a scary term and frankly, it kind of is. But it simply means that you [attempted] to stop the threat and an innocent bystander for hurt by one of your bullets or actions. You are still legally liable for that person and situation. This is why consistent and proper training is so critical. Calling 911 as quickly as possible is vital. You do not have to say much, but you have to give a lot of information. That should be plenty of information, coupled with other 911 calls, for the officers to understand there is an active threat and how they should respond to that threat. When law enforcement arrives try to stay calm. Keep your hands visible and empty and report to the designated area to get medical attention and a report on what you witnessed. After the threat is stopped then you can help the wounded if the situation calls for it. If you don’t have any medical training (not even CPR or first aid, find someone in charge, like a law enforcement officer or paramedic and ask if you can help. Sometimes having an extra set of hands can be all the help they need. There are many companies out there that have first-aid, CPR, trauma courses and TCCC courses available to the public. TCCC stands for Tactical Combat Casualty Care. If you find a TCCC (pronounced “T-TripleC”) certified instructor, they can walk you through the use of quik-clot combat cause, the proper use of a tourniquet, and other critical life saving measures. A TCCC course will give you the most bang for your buck. After all is said and done, consider seeking professional mental health care. You may have witnessed something traumatic and need help coping or dealing with what you saw. Don’t be afraid to talk to a professional if need be.